Struttura datata, arredi e servizi non aggiornati. 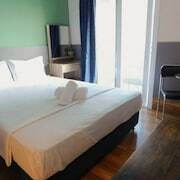 Where can I find hotels in Loutra Oraias Elenis that are near tourist attractions? Planning a trip to Corinth? Would you like to reserve a room conveniently located near the downtown part of Loutra Oraias Elenis? 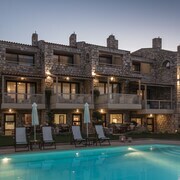 Within easy driving distance of central Loutra Oraias Elenis you'll discover 4 hotels you can choose from. Travelers searching for accommodation close to the heart of Loutra Oraias Elenis should look no further than the Sea View. The Hotel Poseidon Resort can be found 15 kilometres (10 miles) away from downtown Loutra Oraias Elenis. 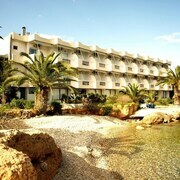 Another hotel is the Club Hotel Casino Loutraki, which is positioned 11 kilometres (7 miles) away. Some more options around this area include the ENALIO Suites and the Alkyon Resort Hotel & Spa. Looking for things to do? Consider spending a few hours enjoying Casino Loutraki and The Diolkos, in Loutraki-Agioi Theodoroi, 13 kilometres (8 miles) to the north of Loutra Oraias Elenis. Should you wish to stay in Loutraki-Agioi Theodoroi, check Expedia's booking pages for the latest deals at the Hotel Pappas and Mitzithras Hotel. Or, you could consider staying in Sikyona, 45 kilometres (29 miles) to the west of Loutra Oraias Elenis, where you can pick from the Arxontiko Kefalari and Pleiades Studios. The Environment Museum of Stymphalia and Lake Stymphalia are just a couple of the more popular sites to explore when you're in Sikyona. Get your fix of local sport by taking a journey to Athens Olympic Stadium, which is 70 kilometres (45 miles) to the east of Loutra Oraias Elenis. Those sports fans wanting to find a room or apartment close by can make a choice from the Hotel Pentelikon or the Semiramis Hotel. For those flying, Eleftherios Venizelos Airport is the preferred airport for Loutra Oraias Elenis. A hotel that is nearby is Sofitel Athens Airport. What are the most popular Loutra Oraias Elenis hotels? Are there hotels in other cities near Loutra Oraias Elenis? What other types of accommodations are available in Loutra Oraias Elenis? Explore Loutra Oraias Elenis with Expedia.ca’s Travel Guides to find the best flights, cars, holiday packages and more!